Frequent power cuts, inadequate transmission and distribution system, regular breakdowns and load shedding, theft of power, variation in supply frequency and voltage of grid, harmonic levels touch 22% THD are responsible for loss, mal-operation or damage to critical consumer equipment. Prima has spent years in research and development to come out with line of power conditioning products that can help consumers protect their equipment and save energy charges. Loss of power constantly threatens to disrupt control systems in every industry. A loss of power, however brief, can cause multiple issues from process disruption to component damage and loss of revenue. The latest generation of uninterruptible power supplies (UPS) takes the guesswork out of implementing an industrial level battery back-up solution to prevent process downtime For years, most panel builders and users would simply place an inexpensive "consumer electronics" level UPS at the bottom of the cabinet in order to withstand just a few minutes of a power interruption. The issues with using these UPS systems are numerous and can cause headaches when dealing with maintenance. The biggest issue with this style of UPS package is the battery. Most of these UPS systems do not have the ability to provide any insight into the performance or health of the battery. This prompts the common practice of replacing the battery on a scheduled maintenance cycle-whether the battery needs to be replaced or not. We have a tie-up with some of the leading UPS manufacturers in the industry. With one of the most comprehensive product offerings available on the market today, we are able to offer solutions ranging from 100 VA to 50 KVA or more, single phase to 3 phase and run times from 10 minutes to several hours. 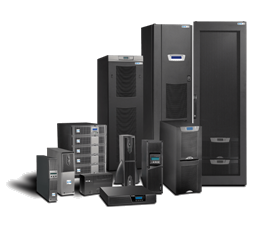 If you are unsure which UPS Manufacturer or product might be best for you, or you would like to discuss your particular power problem, we can provide the technical assistance you need to select the proper UPS System for your needs. Acme Digitek Solutions (P) Ltd. is Systems Integration organization focusing in the areas of Business Applications, Infrastructure Integration, Networking, IT Services and IT Enabled Services. Designed by Acme Digitek Pvt. Ltd.